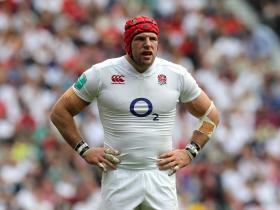 James Haskell will keep his 2019 Rugby World Cup dream alive after agreeing to join Northampton Saints next season, but the forward remains open to a lucrative move abroad in the future after signing only a one-year deal. Having won 77 caps for England – the last of which came in England’s most recent match in the Six Nations defeat by Ireland – 33-year-old Haskell admitted that he was desperate to keep his international career alive by remaining with a Premiership club following his imminent departure with Wasps. At one stage Haskell feared that he would be forced to move abroad, ending any hopes of playing again for England due to the Rugby Football Union’s selection policy and Eddie Jones’ preference not to pick players based abroad in his squad, with the Wasps flanker admitting that he was yet to receive an offer towards the end of last month. But Saints had at least expressed their interest in signing him and came forward with an offer, thought to be a deal in excess of £300,000, to take Haskell to Franklin’s Gardens next season and continue the club’s recruitment drive ahead of their next chapter, with Hurricanes head coach Chris Boyd due to take over as director of rugby next season. Haskell announced earlier this season that he was leaving Wasps when the campaign ends, and with Wasps due to face Saracens in the Premiership semi-finals this weekend, his second spell with the club has a maximum of two games remaining. Having broken into the senior team back in 2002, Haskell left the club in 2009 for stints in France, Japan and New Zealand, before returning to Wasps in 2013 to take his tally of appearances to more than 200. “We’re thrilled to have captured James’ signature for next season, as he’s a player that can bring so much to Saints,” Boyd, who will join Northampton in August, said. “Not only is he a superb leader with bags of experience at the very highest level, but James is clearly still extremely hungry to win trophies in club and international rugby.